U.S. Treasury Secretary Steven Mnuchin and U.S. Trade Representative Robert Lighthizer began a new round of discussions in Beijing today, and reports are that the two sides have made early progress in the current round of negotiations – including perhaps forced technology transfers. The recent issue regarding the Chinese company Huawei seems to be the backdrop to this discussion surrounding technology and the way the US advocated many other of their allies to abandon the Huawei 5G technology for fear of espionage on the behalf of China. This seems like quite a mountain to climb to get to an amicable tech deal, but time will tell. The major Asian stock markets had a mixed day today: KOSPI decreased 17.52 points (-0.82%) to 2,128.10; NIKKEI 225 decreased 344.97 points (-1.61%) to 21,033.76, and Shanghai decreased 27.78 points (-0.92%) to 2,994.94. However, Hang Seng, SENSEX, and ASX 200 took the opposite route. 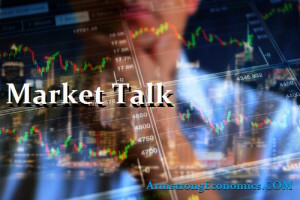 Hang Seng increased 46.96 points (0.16%) to 28,775.21; SENSEX increased 412.84 points (1.08%) to 38,545.72 and ASX 200 increased 40.10 points(0.65%) to 6,176.10. The major Asian currency markets also had a mixed day today: The USDJPY increased 0.0980 or 0.09% to 110.6080 and the USDCNY increased 0.0058 or 0.09% to 6.7436. However, the AUDUSD and the NZDUSD took the opposite route after decreasing 0.0007 or -0.10% to 0.7077 and 0.0008 or -0.12% to 0.6788 respectfully. Both Gold and Silver had a negative day today: Gold decreased 18.40 USD/t oz. or 1.41% to 1,290.62 and Silver decreased 0.22 USD/t. oz or 1.45% to 15.08. Of course, we will have to mention Brexit and the 8 current proposals. Prime Minister Theresa May’s plan failed to win a majority and the motion to reconvene on Monday was discussed. It seems like there is no definitive way forward at this stage. If MPs approve the treaty this week, the UK would avoid a no-deal Brexit on April 12, and instead leave the EU on May 22 under the terms of a decision by the European Council. It seems as if the UK is kicking the can down the road. Will there ever be a Brexit or will the vote go to the public for a re-vote of the initial Brexit (as many MP’s are advocating for). EU leader Tusk has stated the majority of the EU wants the UK to remain. Huawei has become an increasingly important company of late, as they have announced new smartphones and 5G service in the European market, shifting their attention away from the US. A recent report by Open Democracy states that US Christian right ‘fundamentalists’ whom have been linked to the Trump administration and Steve Bannon are among a dozen American groups that have poured at least $50 million of ‘dark money’ into Europe over the last decade. As the Turkish Lira slid 5% today. Turkish PM Erdogan is pointing his finger at the West for increasing prices in Turkey and went as far as calling the West “terrorists” ahead of this weekend’s elections. The major European stock markets had a mixed day today: The FTSE 100 increased 40.14 points or 0.56% to 7,234.33 and the DAX increased 9.12 points or 0.08% to 11428.16. However, the CAC 40 took the opposite route and decreased 4.69 points or 0.08% to 5,296.54. The major European currency markets had a mixed day today: The EURUSD decreased 0.0028 or 0.25% to 1.1219 and the GBPUSD decreased 0.0144 or 1.09% to 1.3046. However, the USDCHF took the opposite route and increased 0.0022 or 0.22% to 0.9967. Wall Street had a relatively steady day today, with the Dow ending up over 91 points (+0.36% , closing at 25717.46), the Nasdaq finishing +0.34% (7669.17 close), and the S&P 500 finishing +0.36% (2815.44. close). The Russell 2000 outperformed, finishing +0.85% (1535.10 close). The Bureau of Economic Analysis reported revised Q4 2018 U.S. economic growth figures at 2.2% – slightly less than originally 2.6% that had been reported a month ago. The readjusted GDP on an annual basis came in at 2.9%. Separately, Freddie Mac reported 30-year mortgage rates fell to an average of 4.06% this week compared to 4.28% the week prior. At the beginning of the year, rates hovered around 4.5% after spiking to nearly 5% during Q4 of 2018. The USD Index rose 0.48% today (last reading 97.23). The USD/CAD index rose by 0.22% (last reading 1.3439). In Canada, the TSX Composite had a modest day, rising +0.14% (16155.49 close), while the TSX 60 had a slightly stronger day, finishing +0.31% (963.84 close). In South America, Brazil’s central bank revised their 2019 GDP forecast from 2.4% down to 2% due in part to the mining tragedy in January and a weaker than expected harvest. Meanwhile President Bolsonaro reassured his base that pension reform is underway. The Bovespa had a strong day, finishing +2.7% (94388.94 close). Trump was quite a figure today in the energy markets. First, he indicated that Russia shouldn’t be in Venezuela and then targeted the OPEC to increase the flow of oil. This naturally caused the markets to decline but later rebounding to beat off the earlier losses. Top commodity gainers were Lumber (3.25%), Canola (0.82%) and Cocoa (0.76%). The biggest losers were Palladium (-6.18%), Lean Hogs (-2.74%) and Rubber (-2.70%). The above data was collected around noon on Thursday.